The path petered out ahead of me, I’d been following footprints in the snow with the odd check of the route on my watch for the past 15 minutes. In an ideal world a map would’ve been involved but the howling wind made any attempt to get anything out of my bag, let alone something that was a potential sail, almost impossible. 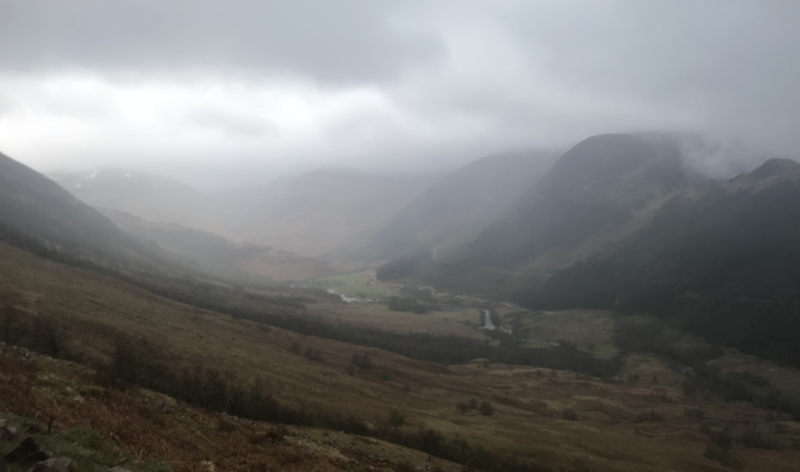 We were heading to the top of Ben Nevis, the first of the three summits that make up the UK 3 Peaks, from about 400m up we’d been firmly surrounded by cloud and the visibility had become increasingly rubbish as we got nearer the top. By now I could see about 5-10 metres in front of me and beyond that everything was enveloped in in edgeless whiteness. I’d spent most of the previous few days reading about the hills we were running up and it had been difficult to avoid the warnings that kept cropping up about the top of Ben Nevis, with the summit of the mountain enjoying close proximity to some pretty serious gullies and cliffs. The presence of late-winter snow would make it difficult to spot the edges of these hazards, and the terrible visibility further exacerbated this heady mix. As I stopped to check my compass and was nearly knocked sideways by the wind I decided to turn back, I didn’t want to be one of those people who had pressed on regardless of the elements and for no real reason other than ‘to get to the top’. I’d reached (my watch later told me) 3,862ft, which was more than enough for the day. About 10 minutes after I’d turned back I caught up with Stu who agreed with the decision, the slippy, wet, windy conditions weren’t enjoyable in any way and the prospect of 2 more hills over the next 20 hours (along with a significant amount of time sitting in the car) didn’t make either of us any more determined to get any wetter than we were. I clenched my fist as tightly as I could to try and wring some of the water out of my drenched gloves. Then Stu pointed out my lace was undone. Trying to do wet laces up with gloves on is impossible so I took them off; my wet, cold, stiff fingers were almost useless but I eventually managed to fasten them with a sort of cackhanded triple knot. As we made our way back down the mountain we passed a few other bedraggled groups of walkers heading towards the top. 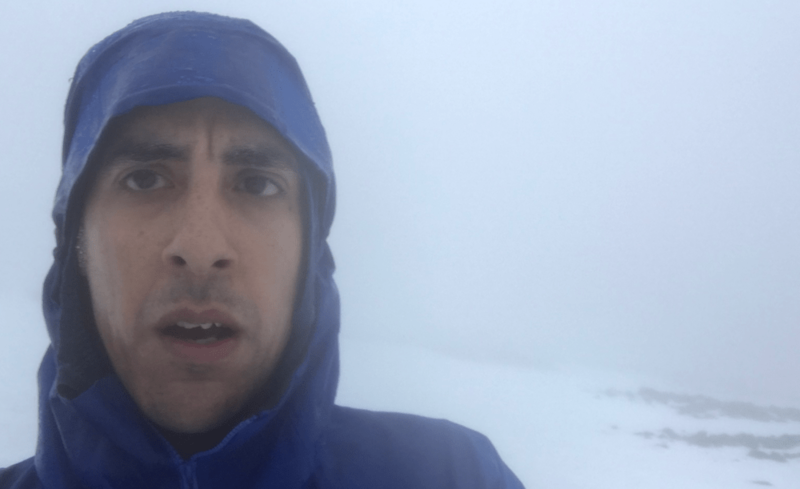 A few of them were woefully underdressed for the conditions (shorts, tshirt and gym shoes) but didn’t really pay any attention to us trying to describe how difficult the conditions were nearer the top. One group seemed to be blasting Jerusalem out of a small, tinny speaker strapped to one of their backpacks. I don’t know if it helped, we didn’t see them again. We drove through the night to the Lake District and our next hill, Scafell Pike. Stu and I dozed as much as we could whilst Alex drove non-stop. We arrived at Seathwaite at about 2am, it was total darkness and as I got out of the car to stretch my already-tired legs I looked up to see a sky spattered with stars, it was beautiful, and silent. Our plan was to start out for Scafell at dawn which gave us the chance for a few hours sleep. Sleeping in a car is never the most comfortable experience but almost immediately I fell into a deep, dreamless sleep only waking when my alarm went off at 4.45. 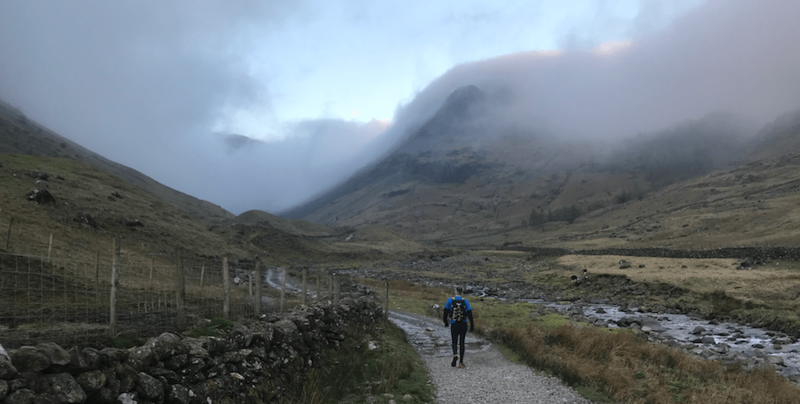 I clambered into my running gear feeling strangely awake and energised, given we’d had about 3 hours sleep, and had a breakfast of a slightly squished banana and an energy bar. It was a clear, still morning and as we looked around us at the sheep and silent fields we stood under mostly cloudless skies. It looked like we had left the terrible weather behind us in Scotland and as dawn began to break over the surrounding hills it looked like it could be an absolutely beautiful day. The only potential problem was that the hill we were heading towards was still wreathed in cloud, the only summit that was. Hoping that the cloud might lift as the sun rose we trotted along the slowly rising path from Seathwaite Farm towards Great End, with Glaramara on our left. We were soon run-walking through a cloud (again) and I began to worry that we weren’t going to enjoy any good weather. Much as I love running in the hills it’s far more enjoyable when you’re a bit dry and can see some of the surrounding scenery! Fortunately it was pretty warm and there wasn’t much of a breeze but going uphill in a cloud means that everything quickly gets totally soaked. However as we started through the edge of the boulder field at Ill Crag the sun began to stream through the cloud and we were soon striding across the top of the fell, above the clouds under a bright blue sky. It was glorious and there wasn’t another soul in sight (the fact that it was about 6.30am probably helped). As we began to clamber the final section towards the top of Scafell Pike a few blokes passed us having come from the opposite direction but as we reached the top we were completely on our own. On our way back down a Mountain Rescue helicopter buzzed overhead, taking off and landing at the top of Great End. We passed the Rescue team, who looked like they were out on a training exercise, before we left the sunshine and back into the cloud which still wrapped the lower slopes of the mountain in a damp blanket of fog. I was feeling pretty good as we came down so had a nice, mostly unbroken, run back to the car passing a growing number of people heading up the hill we’d just been at the top of. Alex was waiting for us still wearing his slightly ridiculous outfit of fleece everything that he’d slept in. 2 Peaks down. 1 Peak to go. 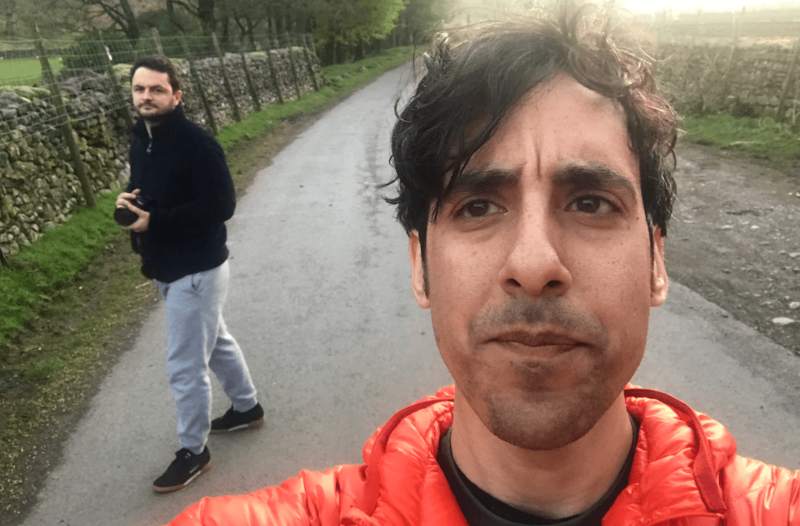 As we drove out of the Lake District we passed an endless stream of vehicles, cyclists, walkers and runners heading the other way. It was shaping up to be a beautiful, hot, sunny weekend. We drove down towards Snowdon, we were going to do the Snowdon Ranger route up from ‘behind’ the mountain (in comparison with most of the more popular routes) which I had hoped would be a little quieter in case it was a nice day (as it turned out to be). It’s also supposed to be one of the easier routes, and after 2 hills in under a day and lots of sitting around in the car an easy route seemed like a really, really good idea. En route I realised I hadn’t brought enough dry socks with me (pair #1 had become sodden on Nevis and pair #2 hadn’t really stayed dry in the clouds on Scafell). Alex suggested hanging them out of the window and letting the sun and the wind do their thing. 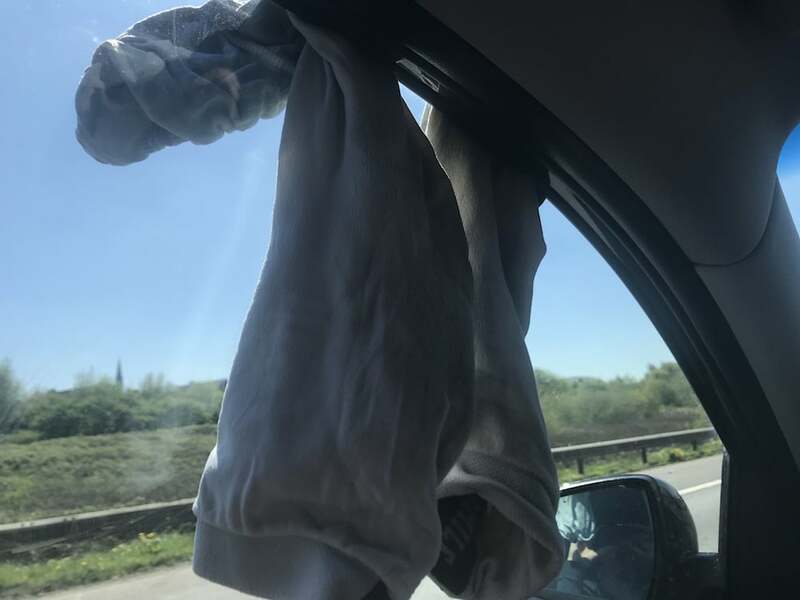 If you ever need to dry some socks whilst driving down the motorway I can report that this method is very effective. 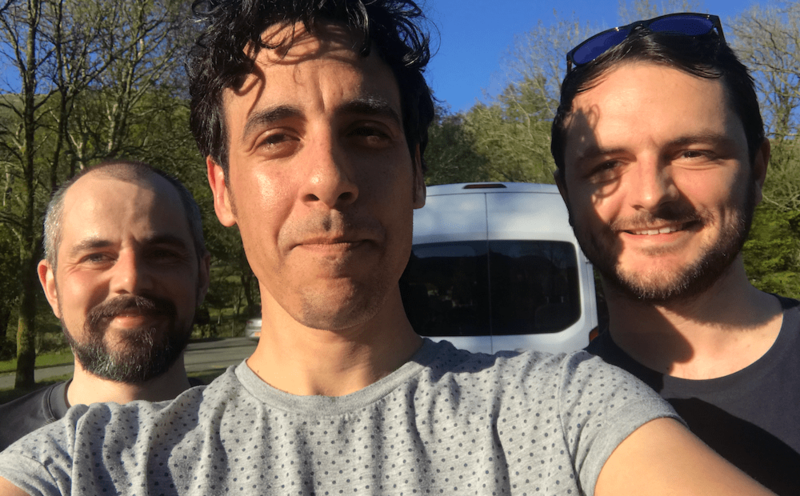 We drove along the north Wales coast with everything looking so green, the countryside seemed to have exploded into Spring. To our right the sea stretched into the distance, flat and waveless. As we passed Llandudno a weird fog enveloped the horizon, it was so thick and localised that we thought it must be smoke but there was no obvious source. It was strange, with the beautiful weather all around us, to stare at this thick smudge on the horizon. We turned into northern Snowdonia and the landscape changed again, the hills all got bigger and bigger but at the same time seemed softer and more rounded than those in the Highlands and Lake District. We parked up by Llyn Cwellyn, Alex made plans to go and dip his feet in the water whilst we went to slog up the final hill. The path zig-zagged up the steep sloper behind the Snowdon Ranger Hostel, it was ace to see so many families out enjoying the good weather. Much like the route we’d taken up Scafell the initial couple of miles (after the first steep bit) of the path was a pretty gradual, forgiving incline and was quite runnable. However once we hit the slopes of Snowdon proper we slowed to a crawl, partly because of the streams of people coming in the opposite direction but mainly because, by now, our legs had turned to lead and no amount of gels, jelly babies and energy bars could coax our bodies into anything faster than a trudge. In the distance you could see the Snowdon train slowly winching its way up the side of the mountain to the top . But the views were incredible. 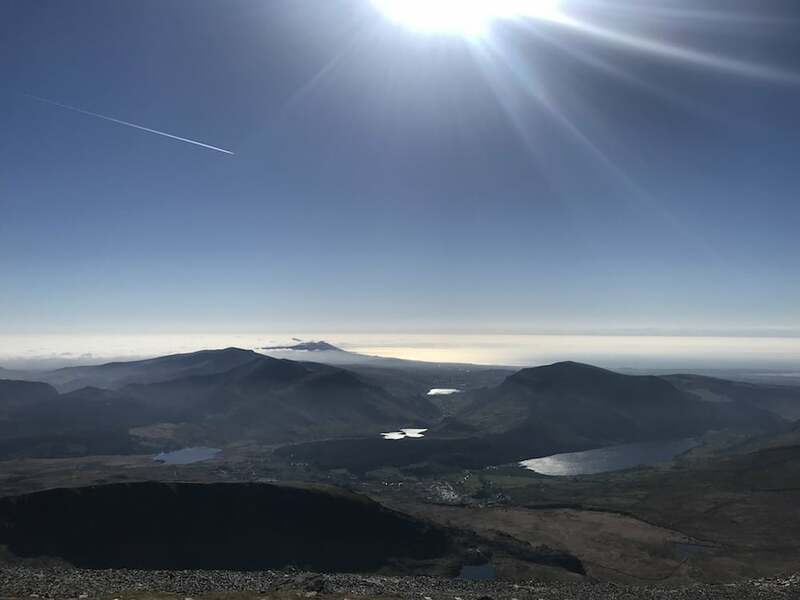 You could see for miles, across the rooftop of Wales, in the distance a pointed peak was poking through a nest of clouds, a plane flew overhead, the sun glinted off lakes in every direction. 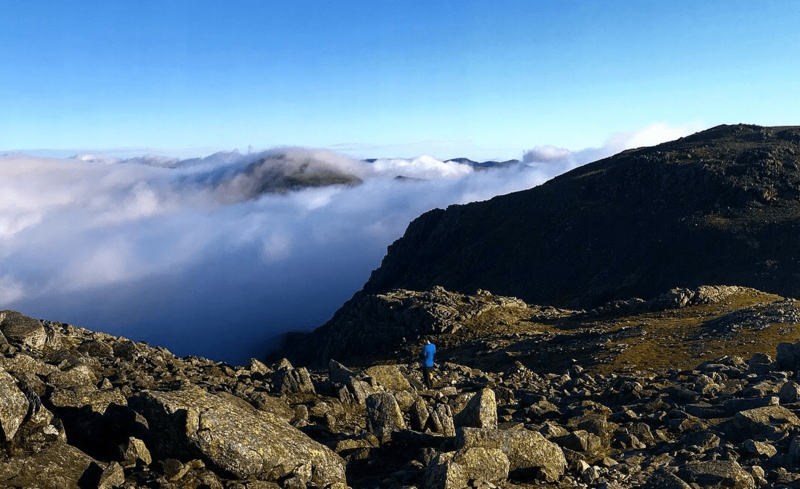 Despite the fact my body felt like it was weighed down and moving through treacle I was grinning to myself, grinning as much as I had as we run up above the clouds on Scafell, grinning in the way that only running up a very big hill on a very nice day can make you grin. As we neared the top, the Rangers Path (the route we’d been following) joined the other (much more popular) paths for the last section up to the summit. Suddenly we were surrounded by loads more people, it was noisy, it was crowded, and the glorious isolation we’d been enjoying evaporated as we became just another part of the bank holiday traffic. It was difficult to feel any real sense of achievement amongst all these people. Although, I’ve often felt this weird…nothing feeling at the end of a big challenge (maybe this says something deeply troubling about me). I guess it’s because I enjoy the planning and the doing more than the finishing and the completing. Maybe it’s a sort of sadness that the thing is finished. We headed back down the mountain and once we’d left the summit behind us we were once again, more-or-less, on our own. As we rejoined the flatter, final stretch I tripped over and took a fairly heavy tumble (directly in front of a group of walkers). I hit the dirt, and skidded along on my front. Without thinking too much about it I tried to bounce back onto my feet and carry on running. Fortunately there didn’t be too much complaining from my legs but my hands and forearms (which had taken the brunt of the fall) were really sore. I looked down to see a brown crust of blood and direct smeared across the knuckles of my left hand and my right palm was pink and raw. I’d also chosen this run to wear my white vest which was now similarly filthy and, on closer inspection, my legs hadn’t survived unscathed and there was blood dribbling down my shin. As I ran past a family a small boy turned, pointed and said “eurgh, what has that man done!? he’s all dirty”. And it’s true, I was all dirty. I arrived back at the car slightly ahead of Stu, Alex was sat there basking in the sun. Whilst we had been running he’d been a good samaritan and had shuttled a father and son who had come down the ‘wrong’ side of the mountain back to Llanberis, he’s nice like that. So that was it, 3 Peaks, in a little over 24 hours. The weather, after a horrendous start, couldn’t have been better. It was really good fun, I’d totally recommend it. We couldn’t have done it without Alex agreeing to do the driving. And I’m not sure it would’ve been much fun on my own, so you need a good running buddy – thanks to Stu for filling that role. So, what next? I’ve always fancied giving the Yorkshire 3 Peaks a go, and I’m off to the French Alps at the end of May.